If you live in the Carlisle, PA region and would like more information about participation in the Playful Pooch Program, please contact Dr. VanFleet using the "contact" section in the upper left corner of this page. The Playful Pooch Program is designed to provide canine-assisted play therapy services to children and families and to offer training in the use of canines in play therapy to mental health professionals. Canine-Assisted Play Therapy is a combination of the well-established fields of Animal Assisted Therapy and Play Therapy. 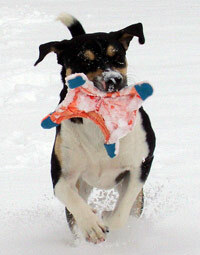 Playful child-canine interactions are systematically used to make progress toward therapeutic goals. Substantial research has clearly demonstrated the importance of the human-animal bond as well as the value of properly trained animals for treating children with a wide range of difficulties. The Playful Pooch Program is just one part of the child’s overall treatment, but it can facilitate progress on many dimensions. Every effort is made to ensure the safety of everyone involved in the Playful Pooch Program. Only properly trained dogs are used, and all interactions with children are completely supervised. Parents or caregivers should discuss with their therapist any pet allergies or prior negative experiences with animals that the child may have had. This program is completely voluntary. In the very unlikely event of scratches or other injuries, staff will immediately inform parents and apply first aid. To date, the program has run successfully with no negative incidents. We prepare children in advance of meeting the therapy dog so they know what to expect and how to greet the dog safely. We teach children some simple canine “body language,“ basic commands, how to give the dog adequate space when interacting, and how to use treats safely. 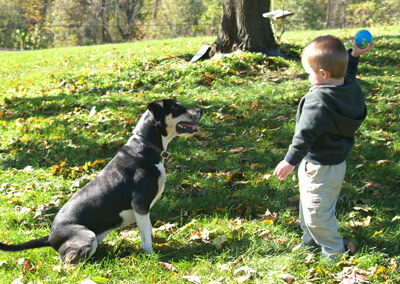 We also give the child suggestions and reminders as they are meeting and interacting with the dog. Any behaviors by the child or the dog that could lead to injury are stopped immediately and a different activity is used. There are many potential benefits of Canine-Assisted Play Therapy. Your therapist will discuss possible advantages for your child when recommending this program. Some of the common benefits are listed below. Canines are playful, and children usually are very motivated to play with them--both speak the “language” of play. I could never take dogs for granted. . . . They were just animals, after all, and it seemed to me that their main preoccupation ought to be in seeking food and protection; instead they dispensed a flow of affection and loyalty which appeared to be limitless. A number of different activities and interactions are used to accomplish therapeutic goals. Some of the options are listed below. Children help train the dog, learning basic obedience commands. They also can help teach the dog new tricks. Children learn how to stay safe with dogs as well as how to keep the dog safe. Children take part in grooming and caring for the dog, learning appropriate touch and sensitivity to the dog’s signals. This can help calm both the child and the dog. Children learn agility activities, such as running a small obstacle course with the dog. When the therapy dog is present as a part of the playroom, children may involve it in some of their imaginary play. Children might communicate their thoughts and feelings to the dog, either directly by telling the dog, or indirectly by stories or artwork involving the dog. 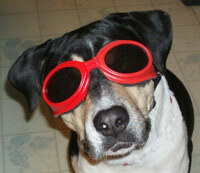 Children engage in problem-solving by helping the dog “resolve” problems that might be similar to the child’s. 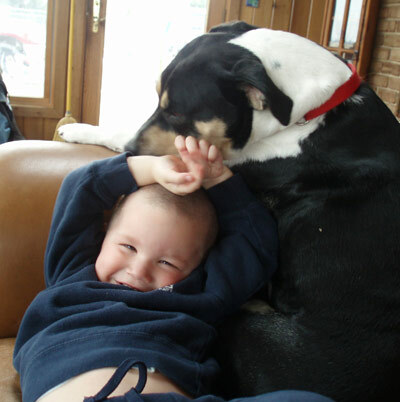 Children learn to self-regulate their emotions and behaviors as they interact with the dog. They learn responsibility for the safety and enjoyment of all involved. Children play a variety of games with the dog, designed to help the child with various problems or to build the child’s confidence. All the interactions are kept playful to maintain a climate of emotional safety for the child. Much therapy work can occur in this environment. Sometimes the children initiate the activities with the canine, and at other times, the therapist suggests brief activities tailored to the child’s personality, strengths, and needs. Children are never asked to do something if they feel uncomfortable with it. Many studies have shown a strong link between people's behavior toward animals and their behavior toward other people. Children who learn to be kind and sensitive with animals are much more likely to use those same behaviors with other children. The Playful Pooch Program is involved in teaching children how to have happy, healthy, and caring relationships with the animals in their lives. Occasionally we offer special programs on this topic, and we are available to speak to school classes or other groups about a variety of animal-related topics, including the benefits of human-animal bonds, animals in nature, the similarities of animal emotions and human emotions, how to meet and greet animals safely, how human play and animal play are similar, how to be friends with animals. Dr. VanFleet also offers some presentations featuring her extensive collection of photos and videos of animals in the wild, animals at play, life in Alaska, and so on. Contact her for more information. We will regularly be adding new articles and information to this website related to the subject of humane education, and our Resources section includes suggested readings on this topic as well as others. On a limited part-time basis in the Carlisle, PA area, Dr. Risë VanFleet offers dog- and people-friendly dog training at your home for everyone in the family. She uses behaviorally-proven methods, with an emphasis on positive approaches that build your relationship with your dog/s. She encourages children to participate. Risë works with most dog breeds, and she offers discounted fees for dogs adopted from rescue/shelter. 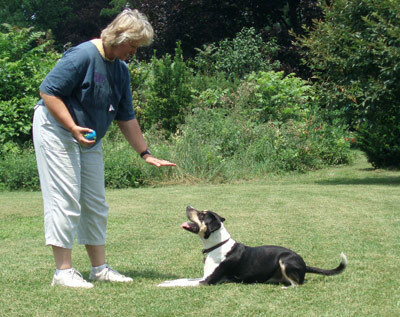 Dr. VanFleet's training style is fun (for people AND dogs! ), practical, and effective, and she collaborates with families to make sure that the training "fits" with their daily lives. If she is unable to provide training, she will suggest other dog trainers who use behaviorally-based, relationship-oriented training. The Canine Good Citizen evaluation is also available. Risë has experience training rescue dogs to prepare them for adoption, so if you've recently adopted a dog and want to get off to a good start, contact her (upper left corner of this page). For a full brochure of the Playful Pooch Dog Training and Behavior Consultation Service, please click here. If you have a dog with behavioral problems, Dr. Risë VanFleet is available on a part-time basis to assist, or when she is unable to help, to make referrals. Contact Risë to discuss a consultation about the following problems and more. Dr. Risë VanFleet is an Approved Evaluator (#26158) with the American Kennel Club's Canine Good Citizen® program. This program is designed for dogs of all breeds, including mixed breeds, to develop and demonstrate good behavior at home and in the community. If you have self-trained your dog or have attended training classes where the CGC was unavailable, you may make arrangements for your dog to be evaluated by contacting Dr. VanFleet.